Yet while causing laughter on the outside, Kopell was, if not exactly crying, at least sniffling on the inside. "People would say, 'Gee whiz, that Siegfried was funny,' but they never put that together with a human being," he says now. "No one had any idea there was a young man underneath all that makeup. Nobody knew it was me getting laughs. I was so unrecognizable that I had some amount of depression, a sense of loss when I was coming off of roles." 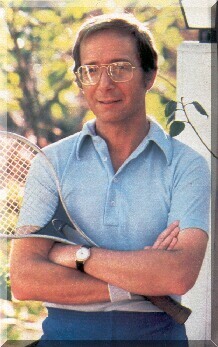 You look at Bernie Kopell and you wonder how it could be otherwise. The man's profile is nonheroic, his face boyish rather than hard-bitten, and while his eyes may twinkle, they do so behind the glint of a formidable pair of glasses. This, you say, is a born second banana, someone with as much chance of making the jump to leading man as J. Fred Muggs. And you are wrong, wrong, wrong. "He's the kind of person mothers would trust to chaperone their daughters while hoping he'd make a pass at them at the same time," says Fred Grandy, better known as Gopher, the trusty ship's purser. As for Kopell, he confesses, "I never in the world thought anyone would buy me as a romantic lead," mentioning things like his "surprisingly naughty" illustrated fan mail. "Women sending me pictures. It's astounding." They kept reminding me, 'We sent you through school, Bernard; we think you could be doing better than this, Bernard.' And I had uncles who would work on me at parties at 15-minute intervals, like 'OK, Al, you go now.' Then it was, 'Bernard, do you realize what you're doing to your father?' followed 15 minutes later by another uncle and 'Bernard, do you realize what you're doing to your mother?' There wasn't an awful lot of support for me getting into show business." His interest in it started when "I'd hear these records playing in the back of the vacuum-cleaner place, positive-thinking records; they were supposed to be morale boosters for the salesmen who'd come back from bombing out. They said your mind is like the earth: whatever you plant, you will grow. If you plant negativity, you will grow negativity. You are responsible for what comes out. It seemed so clear; it made so much sense to me." As for himself, nothing pleases Kopell more than noting that "I did it all backwards. Usually you start as a young leading man and as you get heavier and balder you evolve into a character actor, but my evolution was reversed," a situation he considers final vindication for the positive thinker that's been lurking inside him trying to get out. "It was daring all those apparently negative concepts," he explains, a true believer. "This is what I dreamed about, what I thought was impossible to have, but I have it. And you know what, a voice doesn't come out of the sky and say, 'You don't deserve that.'" And to top it all off, those people who advised him to change careers: "They're now saying, 'I always knew you could be a hit, didn't I tell you you could do it?' " Bernie Kopell smiles at this, but it is a smile of contentment, not revenge.